You are currently browsing the tag archive for the ‘Dr. 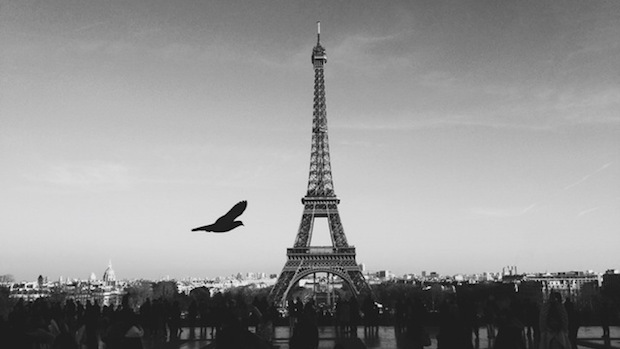 Ed Stetzer’ tag. I suppose you’ve noticed all the gallows humor going on regarding the presidential election. And for good reason. So, have you heard this one? Donald Trump and Hillary Clinton are stranded at sea on a life boat. Who survives? Ha! America does! Now claiming to know God’s mind both for what and with what He is bringing judgment is theologically indefensible and only makes us look silly. (You may recall a few notable Christians who stuck their foot in their mouths after 9/11 and Hurricane Katrina). And yet, as Stephen Keillor argued in his book “God’s Judgments,” it is also theologically indefensible to not acknowledge God’s working in history, including through acts of judgment. Look, I realize that many of my brothers and sisters in Christ have found a level of clarity about the upcoming presidential vote that I have not–perhaps out of resignation or from some political calculations. Perhaps I will too, but until then, I hope there are some things on which we Christians can agree. 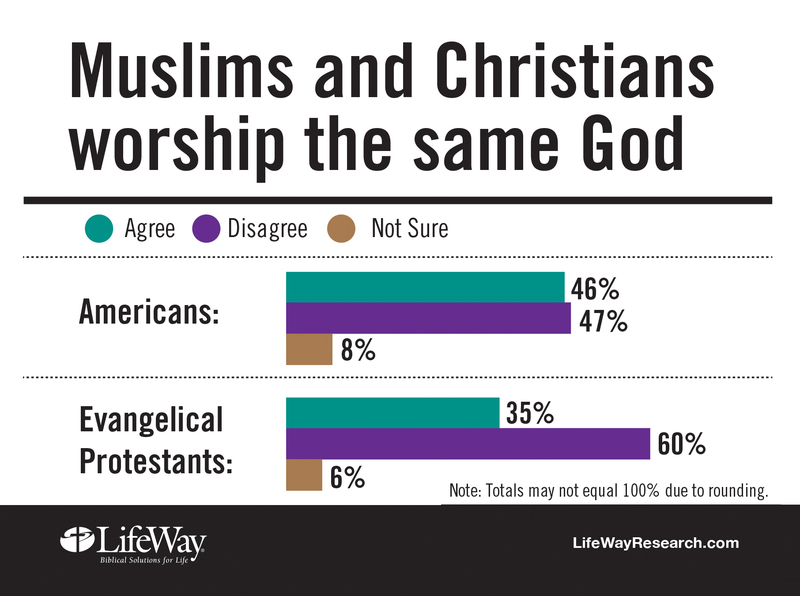 Just a few months ago, in October, LifeWay Research published a good amount of data on how Americans, pastors, self-identified evangelicals, and religious service attendees see Christianity and Islam. Today, I wanted to share just a bit of data with you regarding how similar or dissimilar these groups of people see the two most popular monotheistic faiths in the world. Perhaps the reason for the controversy around such “same god” issues is that the country is split, though you would think that country overwhelmingly believes they do worship the same god based on the responses. But, the nation is actually split down the middle. 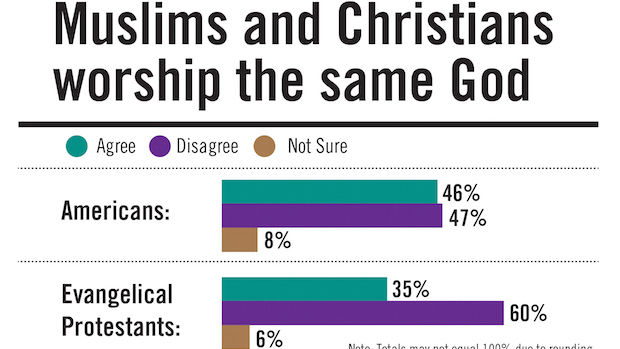 Forty-six percent of Americans agree Christians and Muslims pray to the same God, 47% disagree, 8% are not sure. Those age 18-24 (52%) are more likely to Agree than those 45-54 (40%). Nonreligious (56%) are more likely to Agree than Christians (41%). Catholics (52%) are more likely to Agree than Protestants (38%). Self-identified evangelical Protestants are less likely to Agree (35% v 50%). Those attending a religious service at least about once a week (34%) are the least likely to Agree.